The phone channel remains essential and companies without phone support are few and far between. Lacking a visible phone number on your website can frustrate customers to no end. The phone is an expected and necessary support channel, but its usefulness goes beyond that. Indeed, judicious use of the phone channel can have a myriad of advantages for your business’ image and bottom line. There are service situations in which customers prefer and expect to use the phone. It’s up to customer support teams to meet those expectations. Most customers who urgently require support instinctually reach for the phone. In fact, the majority of consumers report finding a solution to their issue on the first try over the phone. Despite the changing tides, most businesses are quicker to pick up the phone than to respond on any other channel, and customers know it. The measure of call centers’ day-to-day success is often based on first-call resolution. Everyone can relate to the frustration of repeating the same thing to several support agents or over multiple channels. Fixing a customer’s problem on the first try is more feasible over the phone than on any other channel, since a phone call is a contained interaction which lends itself to both immediacy and a personal rapport. 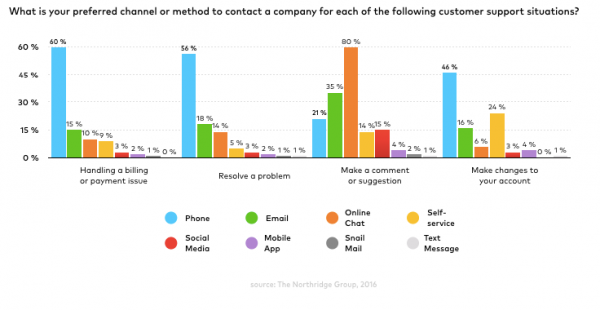 Customers are more willing to be patient and forthright with an actual human on the other end of the line than when they’re waiting on an email or Twitter reply. Moreover, today’s business phone systems are equipped with features that make customers’ experience of the phone more pleasant (IVR, click-to-call, call-back requests, etc.) and give agents the goods (call annotations, shared inbox, CRM/Helpdesk integrations, etc.) to solve issues more expeditiously. When it comes to sensitive data such as billing information, customers prefer putting their trust in a human agent over the phone rather than leaving a written trace. They would also rather call up support to quickly resolve problems (see section #1), and make changes to their account information. These tasks are still overwhelmingly entrusted to phone support agents, who are at their most flexible and empathetic. That last point is precisely why the phone channel remains a cornerstone of customer support. Sure, more and more first contacts happen over channels such as social media, but the complex issues often escalate to a phone call. The overall amount of support phone calls have dropped in favor of alternative channels. Yet the average support call length continues increase: 16% in seven years, despite improvements in call center technology which expedite calls as a whole. This highlights the fact that support queries which escalate to a phone calls are the tricky ones, the ones which specifically need to be resolved through a conversation between two humans (even if one human has cutting-edge technology on their side). It is nigh-impossible to imagine a one-size-fits-all approach to customer service. Therefore, some customer support situations simply require quintessentially human traits such as adaptability and empathy. The phone channel, more than any other, can foster an empathetic and memorable exchange due to the physiological implications on the human voice on an interlocutor. The resulting human connection leaves behind a favorable impression. A successful support phone call can result in more than a happy customer, such as useful customer feedback, a glowing review, etc. This is due to the creation of a rapport. Granted, not every support call is a life-altering occasion for a deeply human connection. Yet, putting emphasis on personal and personalized customer support over the phone can result in a brand being singled out and lauded for the quality of its service. This means loyal customers, brand evangelists, low customer churn, and much more. A strong commitment to exemplary customer support over the phone is the gift that keeps on giving.